The number a player wears becomes a part of him. 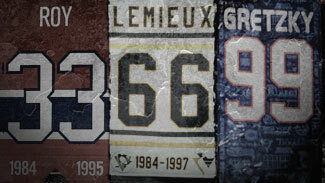 There's not a hockey fan alive who doesn't associate "99" with Wayne Gretzky or "66" with Mario Lemieux. But not every player has a number to himself. For example, five of the Original Six have retired No. 9 (Toronto, the lone holdout, lists it among its "Honored Numbers"). No. 1, the number that for decades was given to the starting goaltender, no longer is available in a number of cities, where it's long since been raised to the rafters. Some numbers are overloaded; others only have a couple of applicants -- and most players wear more than one number during their careers. In trying to determine the best of the best, we've attempted to limit players to the number they wore the most, or the one they're best known for wearing. 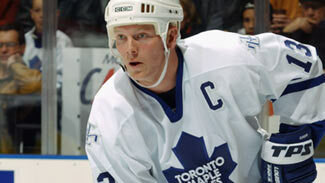 Given those parameters, here's a look at the best of the best of NHL players who've worn Nos. 00 to 33.
Who's the best player to wear No. 1? 4? 9? NHL.com takes a look at hockey's greatest players by the numbers they wore. The future Hall of Fame broadcaster spent 1977-78 with the New York Rangers as the first player in NHL history to wear double-zero. He went 14-13-8 with a 3.18 goals-against average in the second of Jean-Guy Talbot's two seasons behind the bench. With Freddie Shero running the show in '78-79 -- and a more conventional No. 30 on his back -- JD led the Rangers to the Stanley Cup Final. Martin Biron wore No. 00 as a rookie with Buffalo in 1995-96 before switching to No. 43. When Calgary sent Sheehy, a rugged defenseman, to Hartford during the 1987-88 season, he switched from the No. 5 he wore in Calgary to No. 0 for his 26 games with the Whalers. Sheehy went back to a more conventional No. 15 when he was dealt to Washington during the offseason. The owner of the NHL records for wins and shutouts until Patrick Roy and Martin Brodeur came along wins a close race with a number of Hall of Famers. Sawchuk wore No. 1 from the time he broke into the League with Detroit in 1949-50 until he went to Toronto in 1964-65 and took No. 30 because his old number was owned by Johnny Bower. Few defensemen have been as good at controlling the tempo of a game as Harvey, who won the Norris Trophy seven times (six with Montreal, once with the Rangers) in an eight-year span. His offensive numbers soon paled before the totals piled up during the expansion era, but he was the quarterback of the great Canadiens teams that won five consecutive Stanley Cups from 1956-60. Pilote succeeded Harvey as the NHL's best defenseman, winning the Norris Trophy from 1963-65 and making the postseason All-Star team eight years in a row, including five straight as First-Team All-Star from 1963-67. He put up as many as 59 points in a season -- huge numbers for a defenseman in the Original Six era. The argument about whether Orr is the greatest defenseman (or player) in NHL history likely will go on as long as there's hockey. But perhaps no player in history had a bigger impact on the way the game is played -- No. 4 rushed the puck like no defenseman before, and only a couple after. He put up offensive numbers that seemed incredible at the time and still do today. 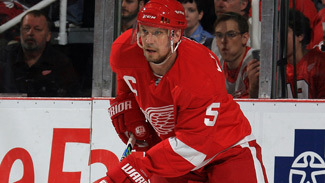 Lidstrom has been the NHL's best defenseman over the past 15 years, winning the Norris Trophy six times in seven seasons and becoming the first European-born and -trained player to captain a Stanley Cup winner, one of the four he's played on. Few players have been so good for so long -- he's still among the NHL's best at age 40. Housley is the highest-scoring U.S.-born defenseman in NHL history, putting up as many as 31 goals and 97 points during a single season on the way to 1,232 points in 1,495 games -- all but one played while wearing No. 6 (he wore No. 96 in his lone game with Toronto, the last of his 21-year career). Only one team (Toronto) has retired No. 6. Espo's No. 7 was a big seller at Boston Garden during the late 1960s and early '70s, when he shattered NHL scoring marks and helped the Bruins set records that lasted until the Wayne Gretzky-led Oilers surpassed them. Esposito wasn't especially swift, but few players were better at getting position in the slot and snapping shots past defenseless goaltenders. He's only been in the NHL for five seasons, but look at what he's already accomplished: four 50-goal seasons, two Hart Trophies, 269 goals and 529 points in 396 games. He's also been a First-Team All-Star five times -- and doesn't turn 25 until Sept. 17. Ovi generates the kind of excitement that few players in any sport ever have produced. Gordie on switching to No. 9. Mr. Hockey outlasted a class of immortals as the best No. 9 (arguably the most talented number in NHL history). Perhaps the most remarkable stat about Howe's career: He finished in the top five in scoring for 20 consecutive seasons, a mark that's as unbreakable as any in sports. He has brought talent, class and dignity to everyone associated with the NHL for more than 60 years. Quick -- who's the fourth-highest scorer in NHL history? That would be Francis, who finished his career with 1,798 points -- including 1,249 assists, the most by anyone not named Gretzky. Though he won both of his Cups in Pittsburgh, Francis earned his nickname of "Ronny Franchise" with the Hartford Whalers/Carolina Hurricanes, for whom he's now an assistant coach. Messier is so renowned for his leadership skills that it's easy to forget he put up 1,887 points, the second-highest total behind longtime teammate Wayne Gretzky. He also scored 694 goals despite reaching the 50-goal mark just once in his career. He's beloved in two cities -- Edmonton, where he helped the Oilers to five Stanley Cups, and New York, where he appropriately scored the goal that ended the Rangers' 54-year championship drought in 1994. The Flames dealt Joe Nieuwendyk, a likely Hall of Famer, to Dallas to get Iginla, the Stars' first pick in the 1995 Entry Draft. While Nieuwendyk helped the Stars to the only Cup in franchise history, Iginla has become the face of the franchise, the highest scorer in Flames history, a three-time First-Team All-Star -- and a likely Hall of Famer in his own right. He never led his team to a Stanley Cup Final or scored 50 goals, but Sundin was an awfully productive player for a very long time. The former Toronto captain is the highest-scoring player in the Leafs' long history and finished his career with 1,349 points in 1,346 games -- in an era that saw very few players average a point per game. Shanahan already was a star when he arrived in Detroit in 1997, but he moved his game up to another level when he became a Wing -- becoming a big part of Detroit's three Cup-winning teams from 1997-2002. He had the last of his six 40-goal seasons at age 37 and finished his career with 656 goals and 1,354 points. Schmidt's career numbers (229 goals, 575 points) might not seem like a lot today, but he was regarded as one of the greatest players of his era. He became an NHL regular at 18, something almost unheard of at the time; led the League in scoring at age 21; was a three-time First-Team All-Star; won the Hart Trophy as MVP in 1950-51 at age 32; and lasted until he was 36. It's not easy to outscore your father when dad was a 600-goal man, but Brett Hull did just that, finishing his career with 741 goals, the third-highest total in NHL history. That includes 226 goals in a three-year span with St. Louis and 86 in 1990-91, the most by anyone not named Wayne Gretzky. Brett didn't have his father's booming slapper, but he had a knack for finding the open spot on the ice and getting his shot off in the blink of an eye. Wayne Gretzky's longtime linemate in Edmonton was surpassed as the highest-scoring Finn in NHL history by Teemu Selanne, but Kurri finished his Hall of Fame career with 601 goals, 1,398 points and four Stanley Cup rings. Though he was the perfect wingman for Gretzky, Kurri was a lot more than just a guy who prospered by having No. 99 as a linemate. The Canadiens spent years regretting that they didn't take the Montreal native with the top pick in the 1980 Entry Draft. Instead, he went to Chicago with the third pick and lit up scoreboards for more than a decade. He may or may not have invented the spin-o-rama, but no one is more associated with the move than Savard, who finished his career with 473 goals and 1,338 points. Rare is the player who's willing to sacrifice offensively to become a more complete player after years of dominating. But that's exactly what Yzerman did -- and the result was three Stanley Cups for the Detroit Red Wings in a six-year span, after a 42-year drought. With 1,715 points in 22 seasons and the longest run as a team captain in NHL history, Yzerman is the greatest Red Wing not named Gordie Howe. Talk about a star basically walking in off the street: The Kings took Robitaille in the ninth round in 1984 and saw him become the highest-scoring left wing in NHL history, with 668 goals. Robitaille scored 40 or more goals in his first eight seasons, surpassed 50 goals three times (and 60 once), and broke the 100-point barrier four times. Not bad for someone taken 171st -- well behind a future Hall of Famer in a different sport, Tom Glavine. Mikita went from a star to an elite player in Chicago as he learned the virtues of staying out of the penalty box. He won four scoring titles in a five-year span, was a first-team All-Star six times, won the Hart Trophy as League MVP twice -- and even earned a pair of Lady Byng trophies for his skill and gentlemanly play after realizing that you can't put the puck in the net while you're sitting in the box. With 541 goals and 1,467 points, he's the greatest scorer in Hawks history. How great was Bossy? All he did was become the first rookie to score 50 goals -- and then score at least 50 in each of his next eight seasons. A bad back that forced him to retire at age 30 with 573 goals likely kept him from breaking Gordie Howe's record for goals before Gretzky. Bossy was one of the four pillars on which the New York Islanders' dynasty was built, and may have had the quickest release of any player in history. 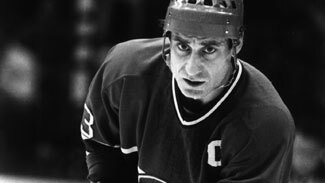 Gainey scored 239 goals in his 16 NHL seasons, but he's in the Hall of Fame for all the goals he helped prevent while helping the Montreal Canadiens win five Stanley Cups, including four in a row in the late 1970s. He was the prototypical checking forward, a four-time winner of the Selke Trophy as the NHL's best checking forward, and the 1979 Conn Smythe Trophy winner as playoff MVP. The newly retired future Hall of Famer had three NHL careers -- one with Montreal, another with Chicago and a third after he was dealt to Detroit at age 37, only to play for another 10 years and add two more Stanley Cups to the one he won with the Canadiens in 1986. Chelios finally retired at age 48 after having earned 948 points in 1,651 games, earned three Norris Trophies and five First-Team All-Star berths, including one at age 38. Andreychuk began his career as a big scorer and ended it as a checker, leader and power-play specialist -- and as captain of the 2004 Stanley Cup champion Tampa Bay Lightning after ending the longest active Cup drought in NHL history. 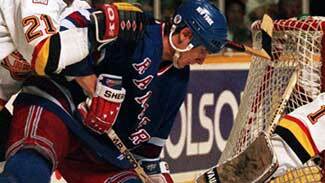 Andreychuk put up 640 goals and 1,338 points in 1,639 games during his 23 NHL seasons, and is No. 1 on the all-time list with 274 power-play goals. Stastny and brother Anton defected from Czechoslovakia in 1980, and Peter, age 24, became an instant star, winning the Calder Trophy in 1980-81 by breaking the 100-point mark for the first of six years in a row. Stastny, the greatest player in the history of the Quebec Nordiques, finished his career with 450 goals and 1,239 points in only 977 games. Niedermayer never put up huge offensive numbers, largely because he played most of his career in New Jersey's defense-first system. The trade-off was success: Niedermayer was part of three Cup-winning teams in New Jersey. He added a fourth ring as captain of the 2007 Anaheim Ducks. One of the best skaters in NHL history from the day he arrived until his retirement after the 2009-10 season. All Larmer did was show up for work every night and make life miserable for the opposition. 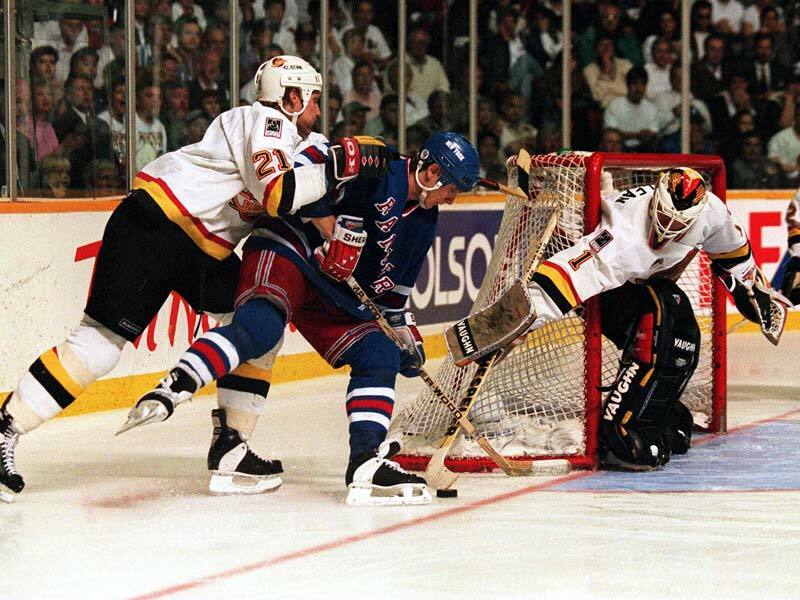 He played every game for 11 seasons in a row and had his consecutive-games streak snapped only by a contract dispute that saw Chicago trade him to the Rangers -- where he was a key member of New York's 1994 Cup-winner. He retired at age 33 with 441 goals and 1,012 points in 1,006 games. No goaltender in NHL history can match Dryden's record of success -- he played just a little over seven NHL seasons and led the Montreal Canadiens to six Stanley Cups, including four in a row from 1976-79. Dryden won 258 of his 397 NHL appearances and finished with a 2.24 goals-against average and 46 shutouts, as well as 80 victories in 112 playoff games. He led the NHL in wins four times and was the First-Team All-Star goaltender five times, including each of his last four seasons, before retiring at age 31. It's hard to believe now that not only wasn't Brodeur the first player selected in the 1990 Entry Draft, he wasn't even the first goaltender (Calgary took Trevor Kidd at No. 11, before New Jersey tabbed Brodeur with the 20th pick). Brodeur owns the marks for regular-season wins and shutouts and could put those records beyond reach depending on how long he plays. He's led the Devils to three Stanley Cups and is arguably the greatest goaltender of all time. Little did the Los Angeles Kings know when they allowed a young goaltender named Billy Smith to go to the expansion New York Islanders in 1972 that they were letting a future Hall of Famer walk out the door. Smith took his lumps with the expansion Isles, but became one of the NHL's great money goaltenders while leading the club to four consecutive Stanley Cups in the early 1980s. Hunter has a unique daily double -- he's the only player in NHL history to score 1,000 points (1,020) in his career while piling up more than 3,500 penalty minutes (3,565). Despite spending the equivalent of nearly 60 full games in the box, Hunter scored 323 goals and added 697 assists with Quebec and Washington, for which he served as captain for five seasons. Roy had two careers and was brilliant in both of them. He spent 10-plus seasons with Montreal, winning two Stanley Cups, three Vezina trophies and a pair of Conn Smyth trophies as playoff MVP. After being dealt to Colorado during the 1995-96 season, Roy won two more Stanley Cups and his third Conn Smythe Trophy during his time with the Avs. His 551 wins were a record until Martin Brodeur broke it; his mark of 151 playoff victories may never be broken.